Detailing the physical features, habits, territorial reach and other identifying qualities of the Arched Hooktip Moth. The splendid, curvy ends of the Arched Hooktip's forewings are made more dramatic by the dark gradient that bleeds into them. A quick look at the tips of the wings will distinguish a Hooktip moth from others. The points of each wing bend down and inward, similar to the shape of a hook. They do not serve any function associated with hooks (carrying, latching, pulling), but they are remarkable nonetheless. Their hairy brown forewings are light near the body and gradually darken toward these arched tips. The wings are crossed left to right with thin, dark brown lines with the darkest one running near the bottom center of the wings. Individuals can vary in shades; some are pale while others are a more saturated brown. A few black dots/spots mark the centers of the forewings and are easy to see when the moth is resting with wings flat. Caterpillars of the Arched Hooktip Moth feed on the leaves of alder and birch trees. They fold up a leaf and use their silk to form a retreat for themselves. They have been heard making soft audible clicks or taps when provoked. Their bodies are green, brown, or even purple at various stages. The 4 or 5 segments near the head have a pair of bumps on them, each with a single black hair extending from it. 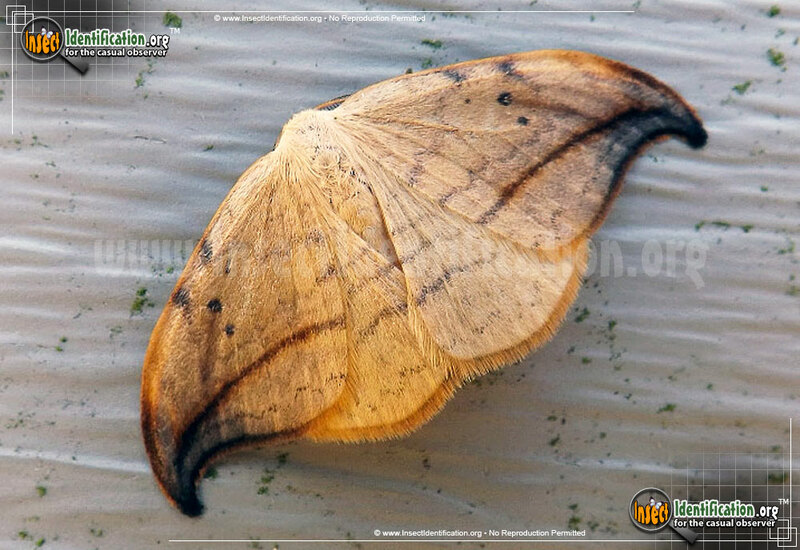 The ventral side (belly) may be a whitish-yellow and the tip of the abdomen tends to curve upward. Females can produce up to two broods each year. The Arched Hooktip is a nocturnal moth and adults are attracted to lights at night. Look for them in hardwood forests, especially in elevated areas, and, in the Pacific Northwest and Northeast, near coastal areas.